Have you checked out Life is good lately? They have some really cute gift ideas for the holidays! I received a beautiful package filled with goodies. I’m excited to share them with you, along with a giveaway at the end of this post! Heads up, this post contains affiliate links. Thanks for your support! Ever since I was a little girl, I’ve always received a pair of pajamas on Christmas Eve. The tradition goes back to my mom’s own childhood. Since I practically live in pajamas, our pajama tradition is one of my favorite things about the holidays! It’s a popular tradition, so perhaps your family already does it. If not, now’s a great time to start! 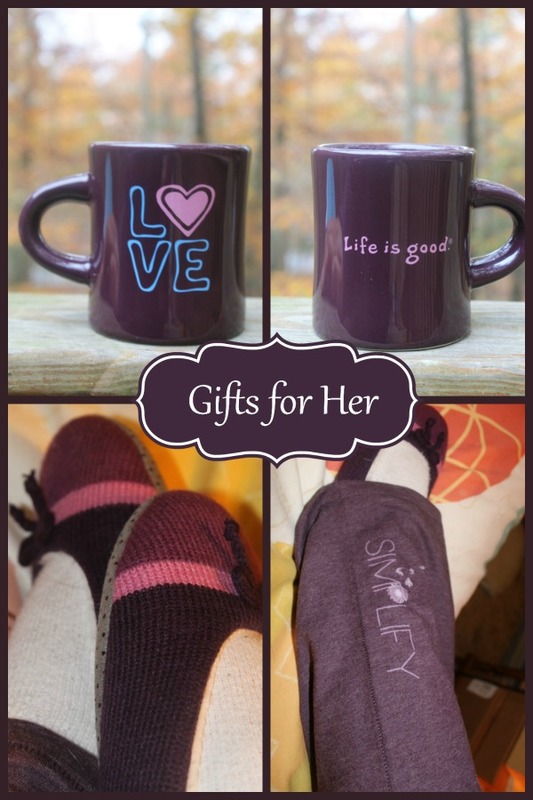 My box of Life is good treats featured a gorgeous pajama set, ballet slippers and a big diner mug. They must be mind readers, too, because everything they sent me was in my favorite color! I basically gave them a list of vague ideas of things I liked and said “surprise me.” They sure did surprise me by picking out everything I absolutely love! This soft pullover sleep top is the most comfortable jammie shirt ever. It’s super cottony with just enough stretch to keep it from being clingy. I love the ribbed sleeves because they don’t slide up when I’m sleeping. I am super weird about that, pajamas need to stay put! Combine them with these matching Women’s Soft Sleep Pants for an amazing pajama gift. The pants are just as soft as the shirt and a perfect match. Together, they’re pajamas that I can totally get away with wearing to the bus stop AND getting out of my car without embarrassing my son! They look like a workout outfit really, but so much comfier. 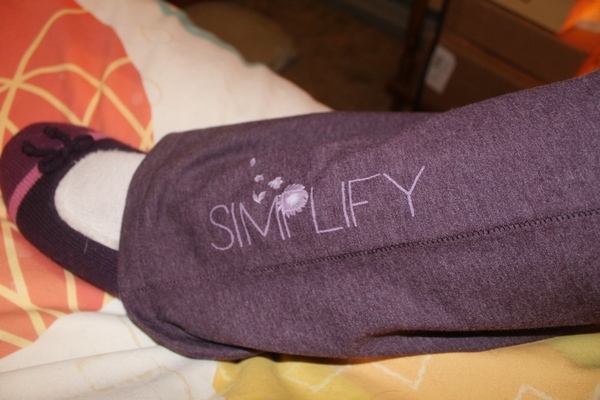 I love the “Simplify” on the pants! It reminds me to chill out and stop over-thinking everything. We all need to simplify our lives once in a while, don’t you think? I could totally live in this set. I’ve washed them twice since I got them! Still super comfy and perfect! Life is good Cozy Ballet Slippers Every woman needs a new pair of slippers under the tree! They go along with the pajamas perfectly! The soft faux-fur lining feels decadent against your toes, even if you’re wearing socks (like I always do). The elastic heel stretches over the back of your foot for a snugger, comfy fit. They totally live up to their “cozy” name. I love that they’re lightweight enough to leave on while I’m reading in bed or watching television on the couch, yet cushy enough to make walking across a hard floor a more pleasant experience! While the purple is my favorite, they do come in other great colors and styles! 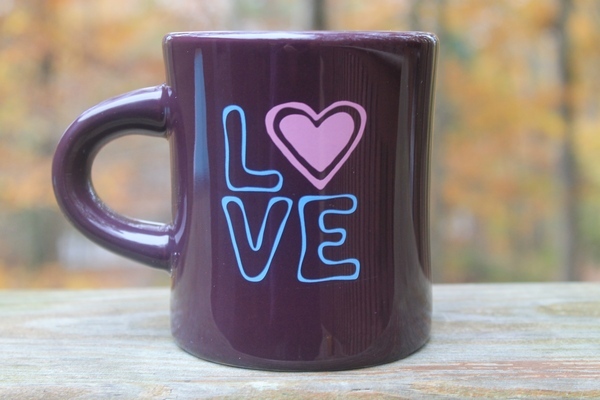 Another item in my absolute favorite color, the Love mug (as I’ve been calling it) is the perfect size for your morning cup of coffee or nighttime cup of tea. It’s big, thick and beautiful. Perfect for relaxing on your deck watching the leaves change colors. Later, it will be just right for watching the snow fall! Made of glazed stoneware, this heavy-duty is microwave and dishwasher safe! When you give a gift from Life is good, you’re helping children in need. I think that’s a pretty darn good thing, don’t you? Ready to shop? You’ll find all the gifts for her mentioned above plus loads more! Take a glance at a few more of my favorites! Head over to Life is Good and start shopping! Those pajamas and slippers look so comfortable! Good idea for a gift! Great gift ideas, thanks for the recommendations. I love the slippers. I keep hinting to my husband that I need some new ones. Maybe I will send him a link to this page as well! Oh I love them all. The clothes and the slippers look super soft, cozy and comfy. I’m off to add them to my wish list for Christmas this year. The colors are perfect! So hard I love it all!! Perfect gifts!! Those pajamas look amazing:) I usually just sleep in whatever over-sized t-shirt I can find. It would be nice to switch it up! I love EVERYTHING from Life is Good. I especially love their pajamas. Whenever I need pajamas, Life is Good is the first place I look. My favorite were the pants – they look softer than anything I’ve ever owned!! So comfy looking. I’m obsessed with coffee mugs so I love the Love Heart Mug the best! I love the Love Heart Diner Mug! It’s adorable. I love the shape, color, and saying! My favorite item you mentioned was the slippers! They look comfy! Of the all the wonderful items offered I would want the matching Women’s Sleep Soft Pullover and Sleep Pants. These pajamas are super cute and they look so comfortable that I may never want to take them off. I would really like the Love Heart Diner Mug. I loved the comfy top and bottoms. I don’t have any decent lounging clothing and these sound fantastic! I love the cozy ballet slippers. I’ve got to get a pair! What a wonderful giveaway. Talk about all the things I love about Fall and Winter, even if I hate the cold, but a warm pair of slippers or even a mug for hot chocolate, or coffee in my case, makes all more bearable. Love it. I like both the pajamas and the slippers. They both look so comfy. The pull over and pants look amazingly comfortable! I like it all but I LOVE the PJS!Super cute! I really like the Women’s Sleep Soft Pullover. I love the color and it looks really soft. Thank you!! Since my feet are always cold, I was interested in the slippers. They look cozy. My favorite are the soft sleep pants…they look so comfy! I love all the Life is Good Products – I would appreciate any of them – thanks! – the PJ’s are really cute. Those jammies are super cute and comfy cozy! These are the BEST JammyJoes!! These are the best Jammy Joes!! I like your review of the slippers and coffee mug. The slippers look so soft and warm and who couldn’t us a new mug. I love the slippers the best. They look warm and cozy. I would love a pair of those Women’s Soft Sleep Pants. The soft pajamas look so warm and comfy. Life is Good has some really great items and the clearance prices are wonderful. I love the slippers, they look so warm and soft. I like the jammies. They look so comfortable. I really like the slippers.I love that they are lined. I love the Life is good Cozy Ballet Slippers the best. I most like the Life is good Cozy Ballet Slippers. I love slippers and that is the type I mainly wear. I like them to have backings and be cushy soft. I like the Women’s Soft Sleep Pants because they look warm and comfortable. I agree with you that the “Simplify” is a nice touch. The mix of a flat/ballet slipper/and slipper is the most amazing thing EVER! I love the Cozy Ballet Slippers! They look so warm and I love the colors! I like the Cozy Ballet Slippers the best. I love the Cozy Ballet Slippers the most! I would love a pair of those! I love the Women’s Soft Sleep Pants that you reviewed. I like the “Love Cup” really cute. I love the Women’s Soft Sleep Pants. Thanks for the giveaway…my daughter would like the Women’s Cozy Ballet Slippers.